Cooney Brother’s launched their first eCommerce site in 2017, taking an established family-owned business online. At the launch, and since then, Cooney continues to evolve and optimize to best serve their customers. 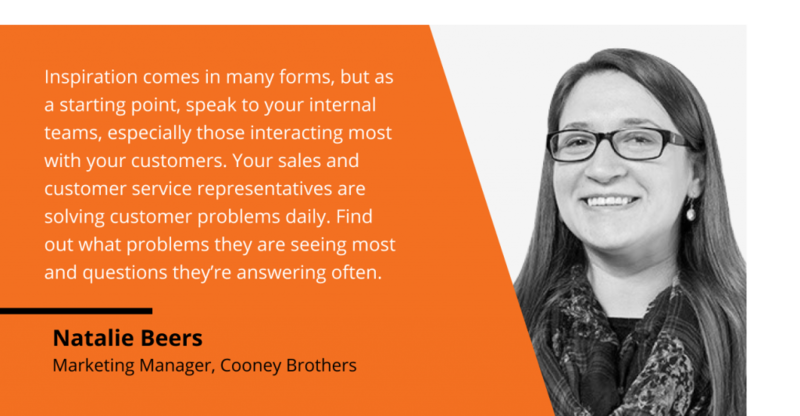 We had the pleasure of talking with Natalie Beers, Marketing Manager for Cooney Brothers. Joining the company shortly before the site launch, Natalie has been drawing from her distribution marketing experience to grow Cooney Brother’s online business. Tell me a little bit about your background professionally and what you do with Cooney Brothers. I joined Cooney Brothers a little over a year ago as their Marketing Manager. This was a new position for them, created as they prepared to launch their first eCommerce website. Having spent the past 12 years establishing and growing the marketing department and online presence of a niche electrical distributor, I saw an exciting opportunity to help a well-established, 80-year PVF distributor enter the digital world. Today, I handle all aspects of marketing and SEO, from developing an email marketing program and creating website content, to working with the eCommerce team on designing and improving website functionality to better meet our customers’ needs. What have been the challenges for Cooney with eCommerce? One of the biggest challenges we have faced since launch has been customer adoption. Some customers registered immediately and have switched to buying online for the bulk of their needs. However, many customers have internal purchasing procedures they must adhere to that fall outside of the standard model of shopping online. For those customers, we are focusing on promoting the aspects of the website they can use – checking pricing and availability, obtaining invoice copies, getting tracking information, and viewing spec sheets and other product data. How do you work to differentiate what you do online from your competitors? In order to stand out from our competition online, we’ve focused on building unique content and enhancing our product data. We’re continually adding upselling and cross-selling options such as related items, accessories, and spare parts, as well as taking high-quality product pictures from inventory. You’ve built out a great library of instructional videos – what was the inspiration and how did you create those? One of the best ways to encourage a customer to use our website is to show it to them. Both our outside sales team and eCommerce team do live demonstrations during customer visits, but realistically we can’t visit everyone. Creating videos has enabled us to highlight and promote the best features of the website when an in-person visit isn’t possible. 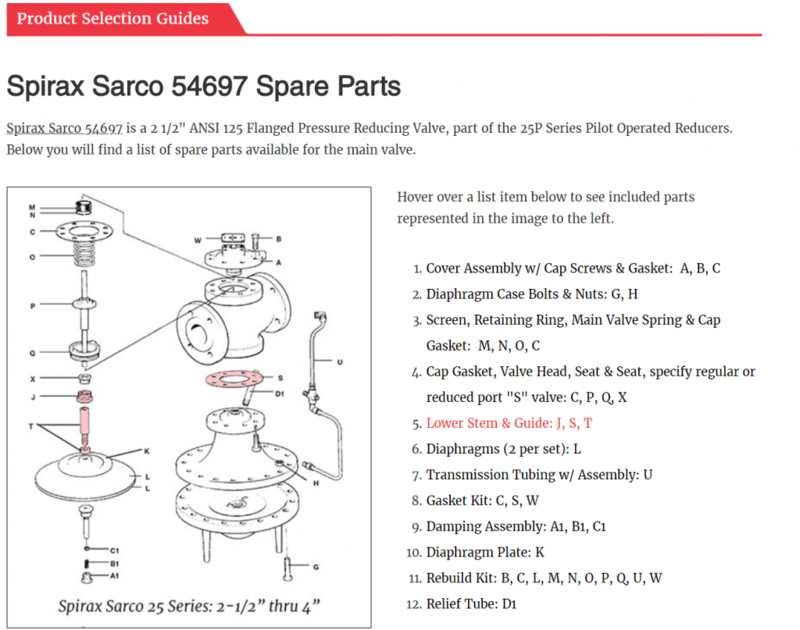 We love the Spirax Sarco buying guide tool you created – it’s a very visual and clear guide to Spirax Sarco parts. Can you tell us what problem you were trying to solve there? Thank you. The inspiration for these actually came from trying to solve an internal problem. When a customer required replacement parts for Spirax Sarco regulators, they often wouldn’t have a part number – they’d be coming to us with an out-of-commission valve sitting on their workbench in pieces with maybe a description or picture of the elements they need. Our sales team didn’t have an easy way to figure out what the customer needed either. After establishing the component(s) that needed to be replaced, they would still end up having to look in at least three places to establish the exact part number. By creating these guides, we created a simple way for both customers and our sales team to quickly look up replacement parts for these valves. By adding the visual hover component, the customer could easily verify which item(s) they need without having to know the correct part name or have a full description. How does this informational content help your business? Having informational content on our website helps our business in many ways. We now have a concise resource for customers – whether as a self-service tool or that the sales team can provide to them. Well-written content is also an additional pathway for new customers to discover our business on the web. For businesses struggling to create original content, what has been your strategy for getting it done? Inspiration comes in many forms, but as a starting point, speak to your internal teams, especially those interacting most with your customers. Your sales and customer service representatives are solving customer problems daily. Find out what problems they are seeing most and questions they’re answering often. Also, ask what would aid them to more efficiently help customers. Often times you’ll be surprised at what is needed most and how it can apply to a broader audience. What trends do you think will have an impact on Cooney’s online business? Cooney Brothers has been in business for over 80 years. We have many established customers and relationships with buyers and engineers who are reaching retirement age. As they exit the workforce, a new generation is taking their place. They are coming into the business world with B2C purchasing experiences driving their expectations in the B2B world. We are being challenged to meet those needs and thus are constantly refining our website to be easier to use. Our sales team is still valuable and necessary, but we need to continue to invest in the digital tools customers expect today for us to remain competitive and continue to grow. Cooney Brothers is an independent, a third-generation, family-owned and operated distributor of pipe, valves and fittings (PVF) and institutional plumbing products that provides a wide range of fabrication, sub-assembly, and other value-added services. With its headquarters just outside of Philadelphia, PA, Cooney has served the Mid-Atlantic region and beyond since 1937, offering a very personalized service through its knowledgeable staff and close manufacturer relationships. Specializing in steam, sanitary and hard-to-find products, Cooney has established itself as a “go to” distributor for customers in pharmaceutical plants, food and beverage processing facilities, OEMs, general industrial, power generators, as well as institutional facilities such as hospitals and universities. As a member of Affiliated Distributors (AD), American Supply Association (ASA), and SupplyForce, Cooney Brothers collaborates with suppliers and other distributors in order to stay competitive through new technology offerings and partner programs. To learn more about Cooney Brothers, visit https://www.cooneybrothers.com/.